Reminds me of Nick and Norah's Infinite Playlist + the photography session. I LOVED THAT part where they included the snapshots in some of the scenes. It was an added charm to the film. The soundtrack they have chosen for the movie was also very much lively and matched the movie so well. Also, as grudgingly as I am to say this… Horikita Maki is indeed one of the best young actresses in Japan. She may not be one of my favorite actresses, but she definitely hits the jack pot whether its in the films or drama series. Maybe it's also the choice of films and dramas that made her a sought out actress? She also doesn't seem to be afraid of having different hairstyles or images and that's pretty good for someone like her. Now on to the film. 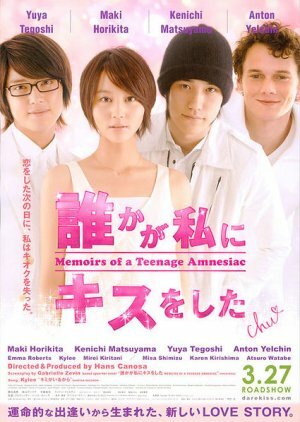 The movie is about Susuke Naomi who incurred an amnesia through an unfortunate incident. She fell down the stairs to save a camera but in the process hit her head on the ground and lost memory of four years in her life. When she woke up, she didn't know that she was in high school, has a jerk for a boy friend named Ace and that she was in a year book with her best friend Mirai. Most of all, she was helped during her accident by a guy named Yui whom she never really talked to. He's like that dark ominous figure in the school who was one year older than her. A lot of things happened to her, like finding out the real her, doing things she had never done before and maturing all through it in the process. The film was really beautiful especially when you see it in the eyes of Naomi. The cinematography was gorgeous and the production was well done. The story line was not that perfect, but the scenes executed by the actors were really good that you wouldn't mind the other boring parts of it and have I mentioned the cinematography? Again… it made up for everything even if the actors didn't.